I take little convincing about the quality and design of Danish furniture. The wood and the clean cut lines are totally to my taste and always seem to fit in with the décor of the room I am furnishing. When I found this perfect set of units for the entrance to my house, I fell in love with them on sight. These units make it easy to just come in and hang up your coat and sit down and take off your shoes so as not to dirty the floors or clutter the house with discarded clothing. For all that, the area does not look like a cloak room or dumping ground. The Cutter Mudroom Set is Made by Skagerak Denmark which is a 100% Danish owned company founded in 1976 with headquarters in Hadsund. Their business activities include design, development and sales of wooden furniture, flooring, gift articles and wood care products. Teak grown in South-East Asia is used in all their production and the planks are dark with a golden or greenish hue and is heavy, hard and stable. With its high content of naturally impregnating oils, teak is extremely resistant to wet and dry and ideal for this type of furniture. There is a large selection of various storage boxes to place under the bench or on the shelf that can be added at extra cost. 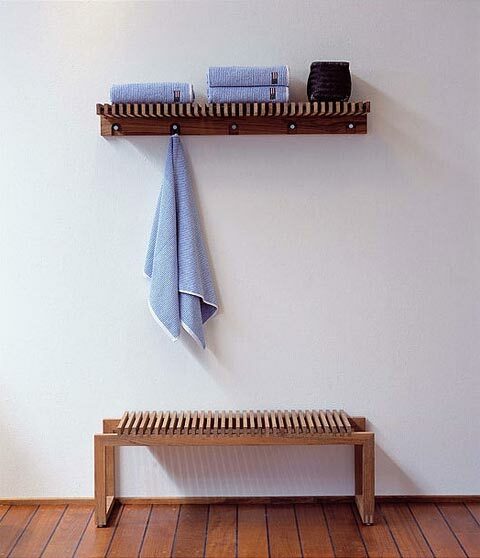 The slatted bench and wall shelf are both included in the basic set and there are hooks for hanging on the shelf. 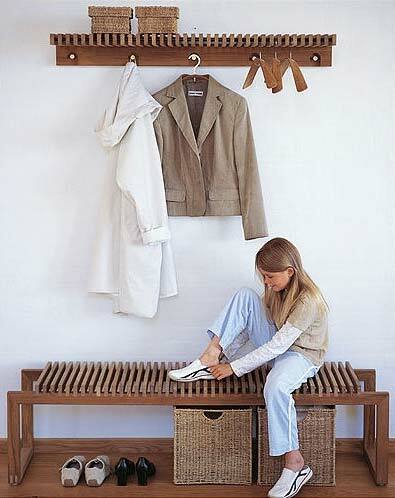 Modern design, great wood quality and practical usefulness make this the perfect addition to the entrance of any home.